Just a little something I’ve run in to when setting up my new FTdx3000. I had an OmniRig setup with my previous FT-450; worked like a charm, including SDR-Console tracking, etc etc. I run everything trough OmniRig as I don’t need any virtual serial ports that way, and it works pretty fast and stable. Even WSJT-X works with it. Here’s the deal though: the supplied FTdx3000 profile for OmniRig, puts “Digital-UP”-mode in RTTY-DATA mode instead of USB-DATA mode. To fix this, I’ve created a modified profile. Just put it in the Afreet OmniRig install folder and select the profile in OmniRig. Should save you all some head-aches. Click here to download it. It also works great when working Split in WSJTX (set split to “RIG”) – e.g. it doesn’t toggle VFO like the default data profile. 069 – Other Disp: 1000Hz – This is needed as the FTdx3000 adds a 1000Hz shift in data mode – utmost importance for FT8! This way – you don’t have to switch any mic settings – data modes have their own profile. I was recently gifted a SDRPlay RSP1 (thanks again ON3HVP!) and have wanted to install an RF-tap for a long time in my FT-450. In our case, we’ll tap at the RX circuitry. It doesn’t see any TX power, so it’s all safe. There’s one caveat: you can’t just solder an extra wire and be done with it. If you connect an extra cable and receiver; you’ll load this stage down, causing your receiver to be less sensitive. Not something we want on HF! Enter a great little board by G4HUP (who is sadly an SK at the time of writing…). The board Dave designed is essentially a high-impedance buffer. So it avoids loading down the RX section, while making sure it has adequate power to drive the input of the RSP1. Seeing we want the full spectrum delivered to the RSP1 – I chose the “PAT V”-board: no filtering, straight from RX on the transceiver; to the RSP1. Basically, we’re tapping at the little BalUn next to the white relay; and we’re powering the buffer from a regulator providing 12V – but only at RX (it mutes the adapter on TX by not providing any voltage). 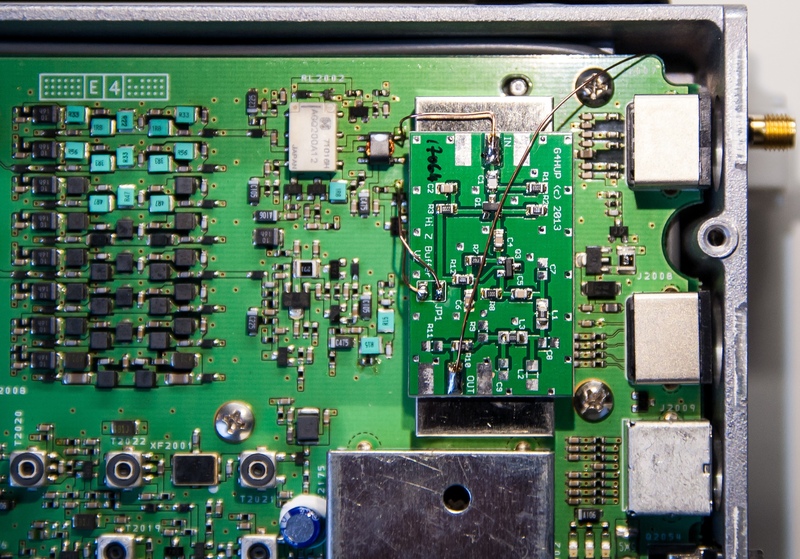 You might ask: “Why aren’t you using a thin coax?” – It’s a recommendation from G4HUP himself: it adds less capacitance which would in turn load down the RX and thus decreasing the signal. Enter SDR-Console V3 with… External radio support (you can see where this is heading… HI). If you have OmniRig set up; you can enable external radio support in the SDR-Console options. You’ll have to restart the program once you do that. You’ll notice an extra window in the DSP setting. Enable the “play” button and the “tracking” button. That’s it. Your PC (and thus RSP1) is tracking your radio, but also the other way around: If you see a signal in the waterfall: click it and you’re QRV on the other station’s frequency. Even better, my logging program (Log4OM) uses OmniRig as well. So I could even click an entry on the cluster, Log4OM sends a CAT command; the transceiver tunes to the frequency; and so does SDR-Console V3. Lately I’ve been having issues where my CAT commands from Omnirig would time-out or vice-versa. (Notably the dreaded “Rig is not responding”) I had been looking high and low why or who was to blame. Factory resetting didn’t change a thing, nor did changing the serial cable. The settings in Omnirig didn’t matter – nor did serial speed. Hmm, maybe RFI is to blame? – Nope. 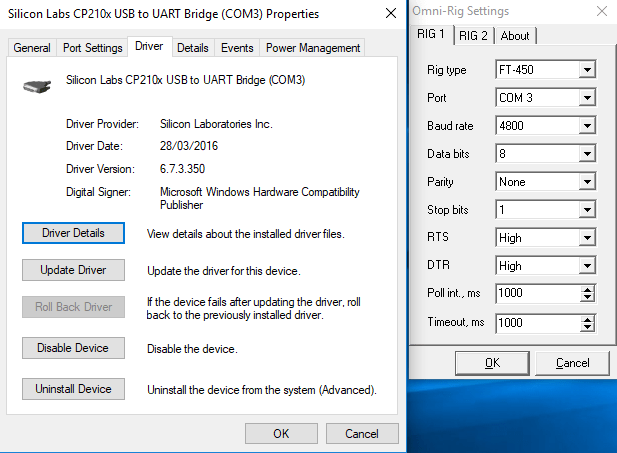 Turns out – the issue is in the driver for the CP210x dongle! If you use the latest version (at the time of writing – v6.7.5) then you’ll experience these mishaps. (I’m betting other rigs using this chipset will be affected too!). In short – you want to revert to a previous version. I got hold of v6.7.3 and the time-outs are 100% gone. Seeing it’s hard to find this version – here’s a link to it. Edit 2018-apr-27: It’s better to select the FT-450D model, even if you’re using the FT-450 (original..). The “D”-profile will return the TX/RX status as well.